Spas are becoming more and more affordable – and the travel industry is taking note! What does this mean for spa-goers? Even better deals as they try to get new travelers interested in the spa experience! Spa experiences for a wider range of tastes and budgets are springing up all over the world, and weary Americans are taking note. Women taking trips together is a hot trend. Whether it’s just relaxing at a spa or working on a ranch, women are planning more vacations together. 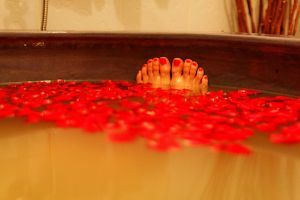 The author then picks out some spas and deals you can get at ’em. Think you’re going to be roughing it in the mountains? There’s nothing grueling about mountain luxurious retreats. Experience mountain serenity at its best. At the Pines Lodge in Beaver Creek, CO, snag a fourth night free. Head to Vail Cascade in Vail, CO, where you stay 4 nights and save more – same with Resort at Squaw Creek in N. Lake Tahoe, CA! Or, if you prefer Canada, stay three nights or more at Fairmont Banff Springs in Banff, AB and save even more! We have this problem whenever we hit the road – we tend to gorge ourselves on whatever delicious food we can find, often forgoing our workout. However, thanks to Westin and Reebok, we have that extra incentive to be on our best behavior. Whether you’re looking to stay fit, recharge, or refine your edge, the WestinWORKOUT package will keep you feeling renewed. Book a WestinWORKOUT package and jump start your day with a healthy breakfast for two. Refuel with complimentary bottles of water daily. Plus, revitalize your workout with tips from Bicycling, Men’s Health and Runner’s World magazines. Spring is here, and there’s no better time to renew your mind, spirit and energy in some of your favorite cities, such as Chicago, Cincinnati, Indianapolis or Philadelphia. Share the romance of the Westin Renew for Two Package or rejuvenate with a Westin Weekend of Renewal. Or, create your own experience and enjoy great rates starting at $89/night through May 31, 2006. Room Only Rates. Book this offer and you’re guaranteed the best rates anywhere.